A page to celebrate 100 years of the Derbyshire Federation. 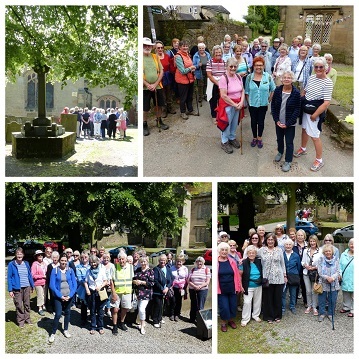 On the day of the DFWI Centenary Walk around Ashover over 70 members from all over the county (and beyond), gathered to enjoy a choice of walks, taking in the sights and history around our special village. Afternoon tea in the Bassett Rooms was a lively affair, prepared and served by the Ashover WI Committee. An information board there on the Bassetts, added another dimension to local, historic characters. No event happens without a lot of planning and help, but it was all worth it judging by the number of happy faces as people left - especially one member from Bamford WI who won the hamper of local Ashover and handmade goodies. The weather was perfect for the Federation Afternoon Tea at Chatsworth House - kindly hosted by the Duke and Duchess of Devonshire. DFWI's first Centenary Luncheon at Hassop Hall with Charles Hanson as guest speaker. What a superb event, exquisite food, beautifully served, and Charles was a quality speaker. And we did it all again with Charles Hanson at the end of October. 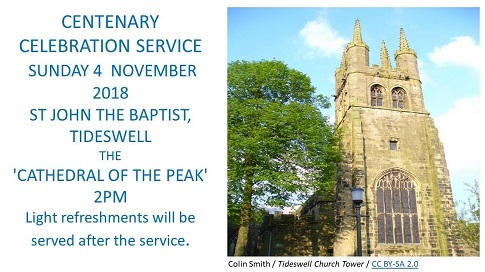 Another super event to celebrate the centenary. Over 110 members enjoyed a delicious two course meal at Hassop Hall at our second Centenary lunch. Charles Hanson once again entertained us with his tales of his life as an auctioneer, antiques expert and TV personality. Another afternoon to remember! 150 lucky members were treated to a tour of the Christmas decorations at Chatsworth House before enjoying a delecious Christmas meal hosted by the Duchess of Devonshire. Here are a few photographs of this delightful event.